With fuel prices taking such a big chunk of our budgets, boaters are more conscious of looking for ways to save. Besides shopping with us to save money, we have some other useful tips to help stretch your fuel dollars. Lose Some Weight...Your boat, that is. We usually tend to take with us more than we need, whether we're going to a hotel on vacation, or just going for an afternoon ride on our boats. If you have extra items you don't need on the trip, don't haul them around. Added weight burns more fuel. Budget Your Trips. You should know how many gallons per hour your boat burns, and how long a trip will take. Figure 1/3 of your fuel for each way, and 1/3 for a reserve. Changes in the weather or water conditions can increase fuel consumption. Don't be penny-wise and pound-foolish by not wanting to stop at a higher priced fuel pump. If you think about it, a couple cents per gallon doesn't really add up to that much when comparing that to the hassles of getting stranded and waiting for someone to bring fuel or having to be towed in. Saving yourself from that situation will make you forget the few bucks you saved passing up a fuel stop. Fill 'er Up! Not only will your chances of running out of fuel be curbed, but keeping your boat's tank full helps prevent condensation and organic growth, which degrade your fuel and affect fuel economy. And be sure to use a good year-round fuel additive, such as StarTron, Quickleen, or one of the many others we have available. Stabilizing fuel isn't just for layup season! Prop It Right. Higher pitch props don't perform as well out of the hole, but they're better for your fuel economy after getting up to speed. Too high a pitch can cause lugging at wide-open throttle. Lower pitches get you out of the hold faster for tubing and skiing. So find a happy medium for best performance, or take advantage of modular props to interchange lower pitch for watersports and higher pitch for cruising. Also watch for dings and dents, which can reduce your prop's efficiency. For more detailed information, click on our Propeller Performance Helpful Hint. Drain Baitwells. If the bait is gone, why bring the water home to port? Water weighs about 8 pounds per gallon. That's a lot of extra weight to lug around. Bottoms up! Keep the boat bottom clean. Whether you use bottom paint or wax, you still can get some growth that creates drag. Make it fun... Go to a beach where you can clean the bottom with a boat soap that's safe for the water, and play all in one trip! Also consider using Teflon-based bottom paint. It offers a smoother surface which is faster, and also easier to clean, than regular antifouling paints. Keep It Balanced. Your passengers are not the only thing that change how your boat rides. 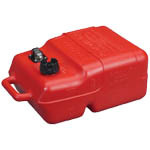 Batteries, fuel tanks, coolers and other gear also can significantly affect the weight distribution in your boat. Power efficiency is best when your boat is riding level. Trim It. Add a hydrofoil or trim tabs for more control. Properly installed hydrofoils and trim tabs improve fuel economy, help you get up on plane faster, and improve ride in different water conditions, at different speeds, and with varying passenger loads. Also, many trim tabs can be raised and lowered independently to help level your boat not only bow to stern, but port to starboard as well. Annual Checkups. Tune up every season for peak performance. Fuel filters, oil filters and fuel/water separating filters also should be changed regularly. For more comprehensive maintenance tips, check out our other Helpful Hints.